With winter officially here, nothing gives me the warm and fuzzies like the smell of cinnamon floating through the house. I have such fond memories of my mother's baking when I was growing up. So much so, that I went on to train as a Pastry Chef. I found that one of the regulars on most menus was Carrot Cake topped with lashings of velvety cream cheese icing. It never lasted long in our house and is still one of my personal favourites to date. This deliciously moist and soul satisfying cake is so simple to make. I've tweaked the recipe slightly by adding brown sugar to give it a slightly richer flavour. I also sprinkle pepitas, walnuts and diced dried apricots on top of the icing. I like how they brighten the cake and give it an earthy look. Method: Heat oven to 180C. Grease and line an 8" round cake tin. Whisk together oil, eggs, sugars, vanilla and cinnamon until smooth. Fold through grated carrot and walnuts. In a separate bowl, sift flour and bicarbonate of soda together. Add carrot mix to the flour and fold through until just combined. Pour into prepared tin and bake for 45 minutes or until skewer comes out clean. Cool before icing. Cream cheese icing Using the whisk attachment of a stand alone mixer, beat cream cheese and vanilla until soft then slowly add the softened butter. Add the sifted icing sugar and beat until light and fluffy. 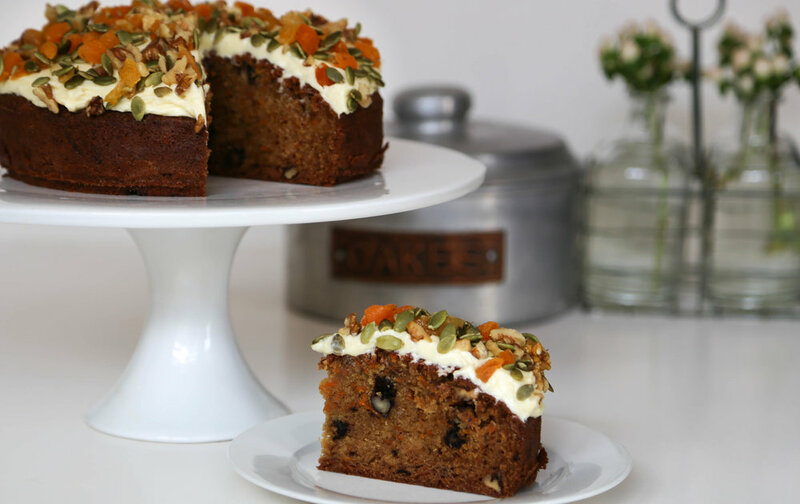 Carrot cake topping Mix together and sprinkle on top of iced carrot cake. Share this with your cake loving friends on Facebook and Instagram using the tool below. Tag #ProjectSweetStuff so that we can find and regram your creations. Happy sharing!